Phelan Conan Ltd, academic robe makers and suppliers, recently contracted Euromech to provide a 55 square metre mezzanine floor for its new premises in Fashion City. As parts of its relocation from Dundrum, Phelan Conan Ltd required a cost-effective solution for the storage of over 30,000 gowns and 40,000 hoods. 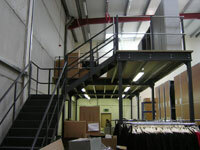 As well as creating additional storage space above the warehouse floor, Euromech also designed the mezzanine floor to accommodate a lift to enable the quick transportation of garments between the two levels. Phelan Conan Ltd has been providing academic robes for students and staff of Third Level Universities/ Colleges in Ireland for over 150 years. They have also supplied robes to world leaders including Ronald Reagan, Bill Clinton and Nelson Mandela. 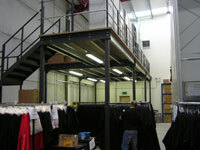 Future developments for the company include a major investment in the form of a steamer/cleaner at its new premises.